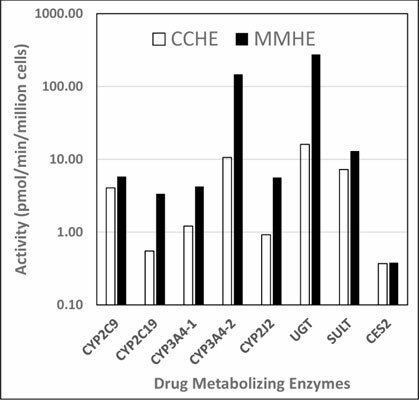 Methods: In this study, we compared MMHE and CCHE in key phase 1 oxidation and phase 2 conjugation Drug Metabolism Enzyme (DME) activities that we recently reported for cryopreserved human enterocytes: CYP2C9 (diclofenac 4’- hydroxylation), CYP2C19 (s-mephenytoin hydroxylation), CYP3A4 (midazolam 1’-hydroxylation), CYP2J2 (astemizole O-demethylation), uridine 5'-diphosphoglucuronosyltransferase (UGT; 7-hydroxycoumarin glucuronidation), sulfotransferase (SULT; 7- hydroxycoumarin sulfation), N-acetyl transferase-1 (NAT-1; p-benzoic acid N-acetylation), and carboxyesterase- 2 (CES-2; hydrolysis of irinotecan to SN38). Both CCHE and MMHE were active in all the DME pathways evaluated, with specific activities of MMHE ranged from 142% (CYP2C9) to 1713% (UGT) of that for CCHE. β-hydroxylation and testosterone 6. Result and Conclusion: Our results suggest that the MMHE system represents a convenient and robust in vitro experimental system for the evaluation of enteric drug metabolism. Permeabilized, cryopreserved human enterocytes, MMHE, CCHE, Drug metabolism enzyme (DME), enteric drug metabolism.